Editor’s Note: One in an occasional series of stories about fitness and recreation programs in the Ann Arbor Public Schools Community Education and Recreation Department, also known as Rec & Ed. This story focuses on Mark Harris, a personal trainer and fitness instructor who shares a lifetime of fitness experiences and why he feels having a fitness routine is important. Personal trainer Mark Harris says getting in shape and staying fit is no more difficult than any other goal in life: take it in small bites and eventually, you will make it to the finish line. He suggests that people just start at the beginning and move at their own pace. But, getting started is what’s important. “People are always looking for an excuse: It’s raining out. It’s Tuesday,” jokes Harris. Personal trainer Mark Harris works with Community High School staff member Chris Hicks in the school's workout room. “Everyone has a comfort zone – to improve, you have to go out of your comfort zone,” he added. Harris owns MAH Fitness and does personal training sessions for Ann Arbor’s Community Education and Recreation Department and is also known around the area as a fitness instructor for Washtenaw Community College programs, as well, teaching at a number of senior and community centers. On this day, he is working at Community High School, where staff member Chris Hicks has signed up for three personal training sessions with Harris. Hicks works as the secretary to Community High Dean Jen Hein and she and Harris have a bit of camaraderie: He is a former Community High parent and Hicks knew him – and his daughter – when she attended there. “I decided I’m getting too old to mess around anymore,” said Hicks, who has come to Harris to get in shape and find a new fitness routine for her life; she is in her second of three sessions with Harris. “I’m pretty happy about it – it’s putting me in the right direction,” she says. 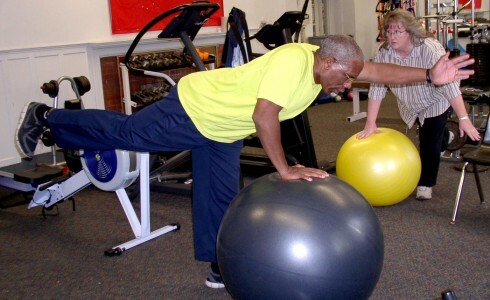 As he does with all of his clients, Harris is showing Hicks how to work out on an exercise ball – all of his stretching exercises, and any “homework” he gives are done with this simple tool, which teaches strength, conditioning, flexibility and balance. Personal Training is a popular offering through Ann Arbor’s Community Education and Recreation Department. Rec & Ed offers the class for beginners through intermediate-advanced levels and makes it available for private, semi-private and in small groups of 3-4 people. The fee is $149 for three sessions ($179 for out of district residents.) visit www.aareced.com or call 734-994-2300 ext. 53233. His motto is “Life’s a journey – travel well.” Harris applies the analogy of moving a mountain one stone at a time to reach the goal. “It’s okay to start small,” he says. Mark Harris says it's important to find balance – both physically and in life.